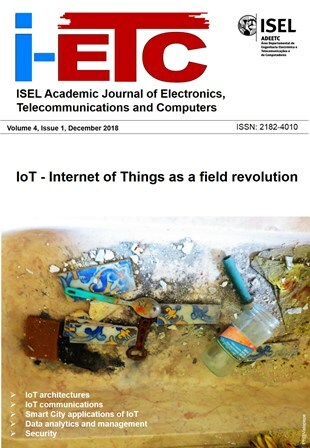 The “ISEL Academic Journal of Electronics, Telecommunications and Computers” (i-ETC) is a peer reviewed online open access journal maintained by the Department of Electronics, Telecommunications and Computer Engineering, at ISEL: Instituto Superior de Engenharia de Lisboa. The journal content is licensed under a Creative Commons Attribution-NonCommercial 4.0 International License. The review process is pedagogically driven to improve quality of manuscripts submitted by young researchers, offering an easy access to a rigorous scientific peer reviewed process. i-ETC charges no publication fees. A selection of the best papers presented at the 11th Ibero-American Congress on Sensors IBERSENSOR2018 will be pubished in this i-ETC Special Issue. Manuscripts should be submitted online, following author registration in the journal website. All papers will be peer-reviewed. IBERSENSOR offers a unique forum for scientific and technological exchange between Latin American researchers who carry out their activities in the field of sensors and their applications. The continued interaction among research groups that this Congress has promoted has contributed to enhance the scientific level of our countries in the field of the sensor, an activity in rapid development and enormous interest and social impact worldwide. IBERSENSOR covers a diversity of interdisciplinary activity areas, as it is the topic of sensors, ranging from physics, chemistry, electrical engineering, engineering materials, nanoscience, (bio) sensors. In addition, it covers aspects on key enabling technologies (KETs), such as nanotechnology, micro- and nanoelectronics, including semiconductors, advanced materials, biotechnology and photonics. The deadline for abstract submission in the Special Issue focused on "IoT: Internet of Things as a Field Revolution has been extended until July 09, due to a high number of requests.